As part of the PBN concept there exist two main macro-categories of navigation specifications: area navigation (RNAV) and required navigation performance (RNP). The main difference between RNAV and RNP is the requirement for on-board performance monitoring and alerting. A navigation specification that includes a requirement for on-board navigation performance monitoring and alerting is referred to as an RNP specification. One not having such a requirement is referred to as an RNAV specification.. The capability to undertake performance-based navigation (PBN) for both rotorcraft and fixed-wing aircraft is one of the “future” navigation concepts being embraced by industry experts around the globe in the present. Representing a shift from sensor-based navigation, the PBN concept sees performance requirements identified in navigation specifications, which also identify a choice of navigation sensors and equipment to be used to meet the performance requirements. According to the International Civil Aviation Organization’s (ICAO’s) PBN manual (Document 9613), the PBN concept specifies that aircraft RNAV and RNP system performance requirements must be defined in terms of their accuracy, integrity, continuity and functionality. In Europe, some of the first applications of PBN have already taken place using the Localizer Performance with Vertical Guidance (LPV) approach and RNP 0.3, which are both part of the PBN family of navigation specifications. In June 2015, a CHC Helikopter Service Sikorsky S-92 equipped with dual Universal Avionics SBAS-Flight Management Systems (FMS) car- ried out the first LPV approach to Florø, one of the first Norwegian air- ports to be equipped with LPV capability. In Switzerland, Rega, one of the country’s leading helicopter emergency medical service (HEMS) providers, has been working closely with the Swiss Air Force on a RNP 0.3 low flight network (LFN) that links hospitals as well as military airfields and landing sites. The Norwegian Air Ambulance is involved in a similar project to achieve an RNP 0.3 instrument flight rules (IFR) route net in Norway. RNP 0.3 is a navigation specification for all phases of helicopter operations with a requirement for on-board navigation performance monitoring and alerting. Under this navigation specification, the required accuracy is 0.3 nautical miles (nm) for all phases of flight, which means that during operations in airspace or on air traffic service (ATS) routes designated as RNP 0.3, the lateral total system error must be within ±0.3 nm for at least 95 percent of the total flight time. The along-track error must also be within ±0.3 nm for at least 95 percent of the total flight time. To meet this performance requirement, a flight technical error of 0.25 nm (95 percent) may be assumed. According to ICAO, the operations envisaged by the helicopter community included reduced protected areas, potentially enabling separation from fixed-wing traffic to allow simultaneous non-interfering operations in dense terminal airspace, as well as low level routes in obstacle- rich environments to reduce exposure to icing environments. Seamless transition from en route to terminal route was also envisaged, as well as a need for more efficient terminal routing in obstacle-rich or noise-sensitive terminal environments — something particularly relevant to HEMS IFR operations between hospitals, and around airports supporting the offshore industry. Other operational needs leading to the development of the RNP 0.3 navigation specification included transitions to point in space (PinS) approaches and for departures. “Most modern IFR twins now come suitably equipped [for PBN] as standard,” Steve O’Collard, a technical pilot at CHC Helicopter, told Vertical. 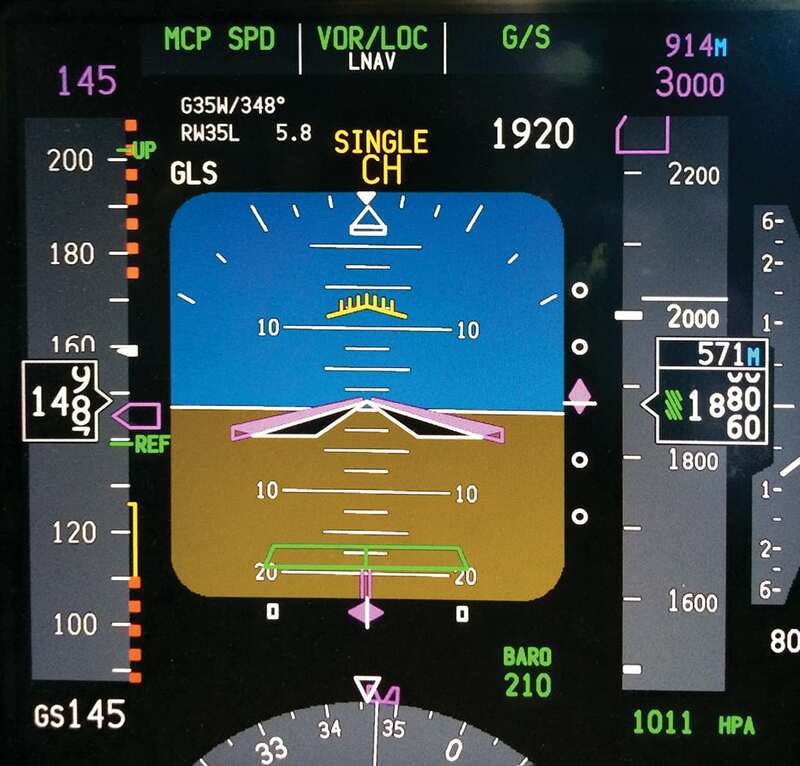 “In addition, there are after-market systems that are fully compatible.” According to Robert Clare, Universal Avionics’ director of sales, there are approximately 120 S-92s in the field with his company’s SBAS- FMS system installed. In Europe, there are not many large-scale implementations of PBN for helicopter operations beyond the use of LPV approaches to aerodromes that have published RNP approach procedures to LPV minima. The acceptable means of compliance to the PBN section of European Aviation Safety Agency (EASA) air operations regulations dealing with operations that require specific approval aren’t even published for the RNP 0.3 specification. This means that operators wanting to implement RNP 0.3 — to derive the benefits of PBN for phases of flight other than the approach phase — must refer to ICAO’s PBN manual. Kistler said that bad weather currently prevents around 600 people from receiving emergency assistance from the air each year in Switzerland. “We see the possibility to increase the number of patients we are able to transport in marginal weather conditions [through the LFN],” he said. “We also believe that by routinely flying on an established, well known IFR network, we can further improve the level of safety as opposed to NVIS-aided VFR [visual flight rules] night operations.” According to Kistler, another setting where RNP 0.3 helicopter operations could provide benefit to both helicopter operators and wider air navigation systems are IFR transit routes through busy airspace at inter- national airports. 0.3 IFR low level routes, supported by WAAS. Raw GPS has an accuracy of 10 meters, but if augmented by either space-based or ground- based augmentation systems, it can achieve accuracy levels of one meter and 10 centime- ters, respectively. For a helicopter company to perform PBN operations, O’Collard said it must first install equipment that satisfies the “aircraft requirements” of navigation specifications. Next, it must have operational approval from the applicable civil aviation authority to use the equipment. “This approval will cover not only normal and abnormal operational procedures, but also training,” he said. ICAO’s PBN manual highlights that airworthiness certification and recognition of RNP 0.3 aircraft qualification alone does not authorize RNP 0.3 operations. “Operational approval is also required to confirm the adequacy of the operator’s normal and contingency procedures for the particular equipment installation applied to RNP 0.3 operations,” the manual states. According to ICAO, the operating procedures to be developed, docu- mented and implemented include pre-flight planning, RNP 0.3 availability prediction, general operating procedures, RNP 0.3 standard instrument departure (SID) and standard instrument arrival route (STAR) specific requirements, as well as contingency procedures in case of loss of the RNP 0.3 capability. The training program should provide sufficient training (in a simulator, training device, or aircraft) on the aircraft RNP system to the extent that the pilot is familiar with the content of the RNP 0.3 navigation specification in ICAO’s PBN manual. Flight crew training should also include required navigation equipment and minimum equipment list for operation on RNP 0.3 ATS routes and RNP system-specific information. Simulator and/or aircraft training should also be delivered to familiarize the flight crews with RNP equipment operating procedures and as contingency procedures. Several regional SBAS programs have been implemented so far, each complying with a common global standard. Therefore, all are compatible and interoperable, and do not interfere with each other. An operator with an SBAS-capable receiver can benefit from the same level of service and performance no matter which coverage area they are in. Existing and in-work SBAS include the WAAS in North America; the European Geostationary Navigation Overlay Service (EGNOS) in Europe and North Africa; the Multi-functional Satellite Augmentation System (MSAS) in Japan and GPS-Aided Geo-Augmentation Navigation (GAGAN) in the Indian subcontinent. Staffeldt, a type technical pilot of the S-92 at CHC Helicopter. “In parallel, the operators should be updating aircraft to SBAS capability and training the crew to achieve RNP authorization. PBN for rotary wing operations has significant potential to improve reliability and safety as well as air traffic management. However, it still has to develop a critical mass. While the availability of technology installations and upgrades put PBN within easy reach for operators, without the sup- port of air navigation service providers (who must develop more public PBN procedures) and industry regulators (who must oversee the opera- tors wanting to upgrade to PBN capability), the benefit of PBN operations for the helicopter community will remain largely unfulfilled. [Avionics Magazine 04-12-2016] United Airlines recently completed a project in the Federated States of Micronesia designed to take advantage of the advanced navigation capabilities of its airline fleet, increase safety, and generally make United pilot’s lives easier there. Working with FAA and ICAO’s third party Air Navigation Service Provider (ANSP) Hughes Aerospace Corp., the airline is now using Micronesia’s first ever Area Navigation (RNAV) Required Navigation Performance (RNP) procedures at Pohnpei International Airport. RNAV RNP final approach at Pohnpei International Airport. Photo: Hughes Aerospace. United is one of the only international carriers servicing the 6,800-foot runway at Pohnpei, and has needed the new procedures for years. The airport has no radar coverage, is surrounded by challenging terrain and has been limited ground-based and RNAV GPS approaches. With this in mind, the airline decided to take advantage of the advanced RNP navigation capabilities featured on its fleet of Boeing 737s. “United has been flying to the islands of Micronesia for many years. Many of the islands, including Pohnpei, only had ground-based approaches known as Non-Directional Beacon (NDB) approaches. The FAA did add RNAV (GPS) approaches but they generally have paths across the ground similar to the NDB. In the case of Pohnpei, this meant the approach was at an angle to the runway. The new procedure offers a straight in approach so the pilots are lined up with the runway when they break out of the clouds,” Ron Renk, chief technical pilot at United Airlines told Avionics Magazine. The new RNP procedures at Pohnpei provide United pilots with vertical guidance down to the runway surface, lowered instrument approach minimums from 920 feet and 3 miles, to 259 feet and 1 mile. Hughes Aerospace worked with United to complete the design, validation and publishing of the new procedures within four months, and the airline has now begun using them. United will also now benefit from reduced fuel burn and carbon emissions at Pohnpei. “The new approach offers many benefits over the approach it supplements. The flight path is optimized with is connection to the enroute airspace, saving fuel and CO2 emissions. It also has lower minimums, meaning we can more reliably get into Pohnpei even when there is [bad] weather. By far though, the best thing for us is the increase in safety offering a straight in approach versus the offset RNAV (GPS) approach,” said Renk. Chris Baur, CEO of Hughes Aerospace, worked with Renk as a third party service provider to lead the deployment of RNP at Pohnpei. He told Avionics Magazine that the use of the new procedures are projected to lead to some significant fuel savings for United as well. The new approaches deployed at Pohnpei are similar to PBN procedures that the FAA has been deploying throughout the U.S. National Airspace System (NAS) under its NextGen program. According to the agency’s latest reported information, 59 percent of air transport category registered aircraft in the U.S. are equipped to perform RNP 1 with curved path procedures, while nearly 100 percent are equipped with avionics to fly more basic forms of PBN such as RNAV 1, RNAV 2 and RNP Approach. Baur said one of the keys to deploying the new procedures in Pohnpei, is the process that the FAA has developed for redesigning airspace to allow properly equipped aircraft to choose the best path and approach to airports with challenging terrain. “Even 10 years ago, the avionics for RNP were not consistent throughout the industry. And that’s changed and evolved significantly over the last 10 years. The FAA’s regulatory process has evolved significantly as well. That allows you to develop these types of procedures,” said Baur. “I’ve been flying since 1979 and I’m blown away by how far we have come. The FAA deserves a lot of credit because they incubated, a lot of this. We have worked with them on it over the years; they are the ones who put this whole plan together. While I think they catch a lot of heat about NextGen, at least from our perspective we think they are doing a great job with NextGen and we enjoy the opportunity to work with them on the implementation of things like this,” he added. Building highways in the sky requires getting your feet dirty. Luckily, I wore boots the day I accompanied a team from Hughes Aerospace Corp. through the ranchlands of Cisco, a tiny rural town smack dab in the middle of Texas. Today’s job: validating a slate of new performance-based navigation (PBN) procedures that Hughes built for the operators of a new airport in Cisco. At the edge of the Angle R property, adjacent to an approach path, a tree limited the minimum altitude for a certain approach; its height had to be verified for a final data package to be sent to the FAA for approval of the procedures. [Avionics Today 08-12-2015] Operators using Myanmar’s two busiest international airports, Mandalay and Yangon, can finally begin using Performance Based Navigation (PBN) practices after the country’s civil aviation authority approved and validated their first ever GPS-based procedures, which were badly needed in the country. Both airports have now unlocked the use of PBN, after flight validations were completed at the end of July through collaboration between experts from Hughes Aerospace and Honeywell. 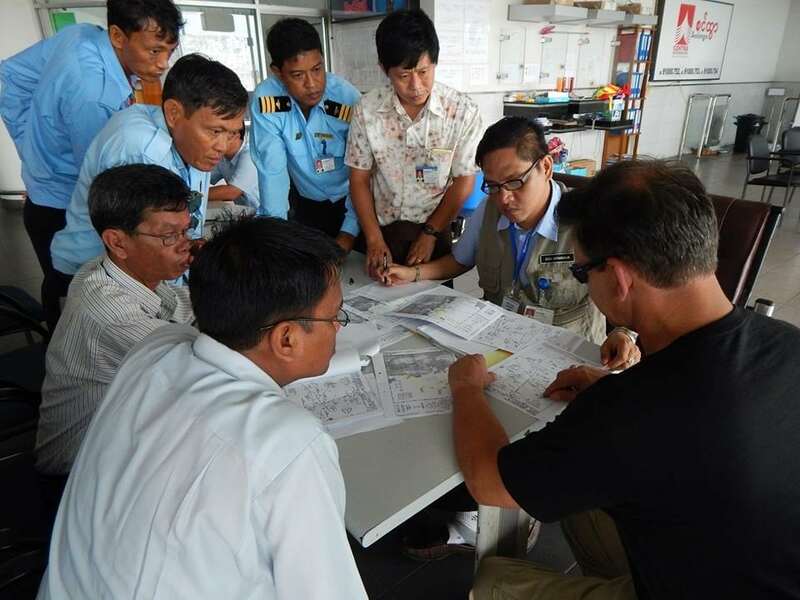 Chris Baur, CEO of Hughes Aerospace, working with a team of Myanmar pilots to implement the country’s first PBN procedures. Using a Cessna Caravan equipped with a retrofitted Garmin G1000 avionics package, Chris Baur, CEO of Hughes Aerospace, lead a team of Myanmar pilots through the first-ever PBN validation flight in Myanmar. Airlines and operators flying into both Mandalay and Yangon can begin using the new procedures immediately, Baur said. Operators will not be required to become certified or undergo any training there, as the majority of international carriers flying with modern aircraft have the avionics equipage and pilot training necessary to fly PBN procedures. Like the rest of the country, Myanmar’s airspace was ruled by a military junta until 2012 and had never undergone modernization of its aviation infrastructure. Over the last several years though, the Myanmar government has been rapidly modernizing its economy, and its airports. While the initial benefits will mainly be around the safety and flight operational efficiency of aircraft flying into and out of Yangon and Mandalay, implementing PBN also serves as a foundation to manage future air traffic growth in the region. The Airbus Global Market Forecast for 2015-2034 has predicted that the Asia-Pacific region will lead the world in air traffic by 2034. Myanmar is the second major GNSS procedures project that the Hughes-Honeywell partnership has completed this year, following the implementation of GBAS approaches in China early this year. Honeywell, like most other major U.S.-based suppliers, sees Myanmar and the greater Asia-Pacific region as a major area of growth for the global aviation industry. Growth begins with projects such as the recently completed ones in Myanmar, and continues with aircraft equipage and air traffic management modernization, according to Michael Underwood, director of business development at Honeywell Aerospace. Beyond Myanmar, Honeywell and Hughes are in similar talks with other Asian-Pacific countries for aircraft navigation modernization projects. [Avionics Today 05-26-2015] China’s Civil Aviation Administration (CAAC) has unlocked a new capability for reducing delays and increasing efficiency at the country’s most congested airports that could be ready for live operational use by the end of this year. A recent flight demonstration by Honeywell and Hughes Aerospace showed the benefits of the SmartPath Ground Based Augmentation System (GBAS) for next generation GPS-based precision landings. A cockpit display shows the GLS approach into Pudong Airport used during the April flight demonstration. Photo: Hughes Aerospace. Using a China Eastern Airlines Airbus A321 and a Shangdong Airlines Boeing 737-800, flight crews demonstrated the first ever Global Navigation Satellite System (GNSS) instrument approaches in China at the end of April. To enable these precision landings, SmartPath’s four ground-based antennas take an aircraft’s GPS signals and sends them to a single box located on the airport, which then correlates the signals for a high degree of integrity before beaming it back up to the aircraft for precision landing guidance. Hughes Aerospace CEO Chris Baur also noted that the demonstrations were done in Instrument Meteorological Conditions (IMC), providing a real world flight environment for the airline pilots. “We built GLS approaches to all of the runways at Pudong,” said Baur. “We built GLS approaches to 35L and 35R and 17L and 17R. Then we did something that hasn’t been done anywhere before where we built multiple GLS approaches to one runway. For Runway 35L, we built a straight-in GLS approach and variable geometric path approaches, one with a 2.8 degree flight path angle and one with a 3.2 degree flight path angle. Baur said the team also built two non-linear curved path, or XLS, approaches for Runway 35L, and the approach was flown to an automatic landing in IMC conditions. The trial flights provided a demonstration that exploited all of the benefits of the SmartPath technology, such as the ability to merge GLS with Required Navigation Performance (RNP) procedures to create a custom path to the runway based on the type of aircraft being flown. Hughes Aerospace CEO Chris Baur and the flight crew from Shangdong Airlines that performed the precision landings demonstrations. Photo: Hughes Aerospace. Davis says the implementation of the new procedures at Pudong can provide a model for dealing with wake turbulence issues from different aircraft as well. With heavier aircraft such as Boeing 747s, 777s or Airbus A380s dispersing an enormous amount of wake turbulence from the wings, aircraft in trail behind them are often forced to maintain very lengthy separation distances. An airport as busy as Pudong can face huge efficiency challenges when this happens. SmartPath has already been deployed in Australia, Brazil, Germany, Spain and Switzerland, and CAAC sees it as one of the key tools for managing future increases in air traffic. The International Air Transportation Association (IATA) expects China to have 415 million air travel passengers annually by 2016, which would be second only to the United States in domestic passenger volume. According to Davis, the majority of aircraft coming off of production lines today are equipped with Multi-Mode Receivers (MMR) capable of performing GBAS landings and the localizer guidance and glide slope guidance for a SmartPath approach looks the same to a flight crew as if they were flying an ILS approach. Going forward, the new procedures must now be certified by the CAAC and Air Traffic Management Bureau. “We should have this station up and certified by the end of 2015, or the early part of 2016 with many airlines ready to fly the new GBAS procedures shortly thereafter,” said Davis. The one-day demonstration on April 29 took place at Shanghai’s Pudong International Airport using a China Eastern Airlines Airbus A321 and a Shangdong Airlines Boeing 737-800 with senior officials from China’s Civil Aviation Administration (CAAC) and air traffic management bureau onboard. Anchoring the capability is a Honeywell SmartPath ground-based augmentation system (GBAS) that has been operating at the airport since January. The approaches at Pudong demonstrated key benefits of a digital GBAS landing system (GLS), including the ability to merge the GLS with satellite-based required navigation performance (RNP) procedures for a customized 3-D path to the runway. RNP provides the aircraft with narrow horizontal and vertical paths into the vicinity of an airport, where GLS provides the precision guidance to landing. The SmartPath system, the first certified GBAS landing system to be installed in China, uplinks digitized approach paths and correction factors to GPS signals to allow an aircraft equipped with a multi-mode receiver capturing GPS signals from space and the GLS information from the ground station to fly as many as 26 approaches to multiple runways. A GLS can replace or augment traditional instrument-approach architectures that use analog horizontal and vertical guidance transmitters placed at each runway end to transmit a straight-in path to the runway, typically at a 3-deg. glideslope. Those systems are costly to maintain and require flight inspections on at least a semi-annual basis. Navigation procedure developer Hughes Aerospace drafted eight approaches for Pudong in partnership with Honeywell. Included are GLS procedures for Runway 35L that offer a traditional straight-in approach with 3-deg. glidepath, a curved approach that mates with an RNP arrival and intersects a straight-in GLS final, a straight-in approach with 2.8-deg. glidepath and a straight-in approach with a 3.2-deg. glidepath and a 3,517-ft. displaced threshold. RNP approaches with curved paths can be used to join with a GLS approach closer to the airport, saving track miles and fuel compared to legacy approaches, or to avoid noise-sensitive areas. Chris Baur, president and chief executive of Hughes Aerospace, says choices for glidepath angle potentially could allow airports to increase runway throughput by mitigating wake turbulence concerns. For example, the arrival rate could be increased by having a heavy aircraft fly an approach with a lower glidepath while a lighter aircraft uses the steeper glidepath approach with displaced threshold. SmartPath, to date the only FAA-certified GLS on the market, is installed at several airports worldwide, including Newark (New Jersey), Houston, Frankfurt and Sydney, where a growing number of aircraft equipped with multi-mode receivers (MMR) can access the capability. The systems are currently approved for Category 1 instrument approach minimums (aircraft must be in visual conditions at 200 ft. above the runway to continue the approach), but the FAA and others are working toward Cat. 2 (100-ft. minimums) and Cat. 3 capability (50-ft. minimums or less, including autoland) in the next several years. The FAA says Cat. 3 operations could be available in the U.S. in 2018. A handful of airlines globally are beginning to use GLS as an alternative to a straight-in legacy instrument landing system (ILS) with a 3-deg. glideslope, particularly as newer aircraft are available from the factory with the option. Boeing says it has more than 1,000 GPS-equipped in-service aircraft, with the number growing by 25 per month. The airframer says one-third of all new 737s are being delivered with the MMRs, which are standard equipment on the 747-8 and 787. Delta Air Lines conducted its inaugural GBAS landing with a Boeing 737 at Newark Liberty International Airport on Feb. 18, joining United Airlines and British Airways, which were already flying the approaches there. The FAA says United is averaging 65-70 GBAS landing system (GLS) approaches at Newark and Houston’s George Bush Intercontinental Airport each month with a portion of its 737 and 787 fleets. United has 95 737s and 14 787s with MMR avionics, and is selecting the option for all new 737s. Delta is using the approaches in Houston as well as in Newark, and has a fleet of 42 GLS-equipped 737s. The carrier is investigating GLS for its Airbus fleet. In total, the airline plans to have 177 aircraft equipped for the approaches by 2019, according to the FAA. A growing number of international airlines also are using the capability at Newark and Houston. Emirates conducted its first GLS landing in Houston in December with an Airbus A380, one of 57 GLS-equipped A380s at the time. The carrier also uses the approaches at Frankfurt, Sydney and Zurich. Lufthansa made its first GLS landing in Houston in December with one of 12 equipped A380s that also use the approaches at Sydney and Frankfurt. Cathay Pacific made its first GLS landing in Houston, with a 747-8, at the end of January. The FAA says Virgin Atlantic is also planning to seek operational specification approval for the approaches into Newark. Other carriers purchasing GLS-equipped aircraft include Air Berlin, Qantas, Swiss, TUIfly and various Russian airlines. Next steps for Pudong include CAAC certification of the GLS at the airport, an inaugural process that may allow for quicker installations at other airports in the country. A China Eastern AirlinesAirbus A321 and a Shandong Airlines Boeing 737-800 flew a series of instrument approaches to the Shanghai Pudong International airport on April 29 using a Honeywell-built ground-based augmentation system (GBAS) and instrument-approach procedures developed by Hughes Aerospace, marking the first public demonstrations of the technology in China. The Honeywell SmartPath GBAS landing system (GLS)—which augments GPS signals to boost accuracy to required levels—is the first certified system to be installed in China. One GLS, which can output guidance for up to 26 approaches to any runway, replaces traditional instrument-approach architectures that require horizontal and vertical guidance systems to be placed at each runway end. The single system covers approaches for all four runways at Pudong and saves on a variety of regular inspection and maintenance costs. SmartPath, to date the only FAA-certified system on the market, is installed at several airports around the world, including Newark, Houston, Sydney and Frankfurt. The GLS is currently approved for Category 1 (Cat 1) instrument approach minimums (aircraft must be in visual conditions at 200 ft. above the runway to continue the approach), but the FAA and others are working toward Cat 2 (100-ft. minimums) and Cat 3 capability (50-ft. minimums or less, including autoland) in the next several years. The FAA says Cat 3 operations could be available in the U.S. in 2018. Other “firsts” on April 29 include the demonstration of curved approaches that connect to the GLS, and approaches with lower- or higher-than-standard glideslopes, including a 2.8-deg. flight path angle (FPA), a 3.2-deg. FPA and the standard 3.0-deg FPA. The 3.2-deg. FPA approach also included a displaced threshold of 1,072 ft., an offset that could help avoid the potential for wake turbulence during parallel runway operations, Hughes Aerospace CEO Chris Baur said. Hughes, which is partnered with Honeywell on the project, is one of three FAA-certified third-party providers of NextGen procedures. Baur said the company built eight approaches into Pudong. The two commercial aircraft each flew 4-5 non-revenue approaches in instrument weather that day, he said. Next steps for Pudong include certification at the airport by the China’s Civil Aviation Administration (CAAC) and Air Traffic Management Bureau, a process that may allow for quicker installations at other airports in the country. ORLANDO, FL (March 5, 2015) – Bell Helicopter, a Textron Inc. company, (NYSE: TXT), has contracted Hughes Aerospace Corporation to develop performance based navigation (PBN) procedures for use by operators flying Bell helicopters with advanced onboard navigation systems in China. The selection process for the first location in China is underway. Performance-based navigation (PBN) is a general term that defines navigation performance requirements for an air traffic route, instrument procedure, or defined portion of airspace. PBN provides safer and improved access to airspace, reducing the possibility of Controlled Flight into Terrain (CFIT), and improves all-weather helicopter navigation. Satellite-based navigation delivers lower approach minima resulting in fewer weather-related delays and diversions, fuel savings due to less flight time through optimized routing and more reliable, repeatable flight paths. Bell Helicopter, teamed with Hughes Aerospace, is exploring the development of performance-based navigation (PBN) procedures for Bell operators in China equipped with advanced navigation systems. 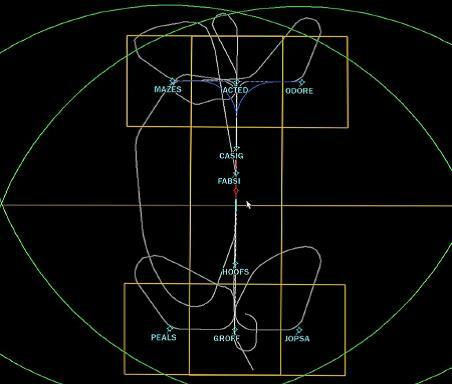 PBN defines navigation performance requirements for air-traffic routes and instrument procedures. The procedures would enable the helicopter operators to optimize access to airspace, flying more direct approaches and departures than they would otherwise under IFR-base routes or those designed for fixed-wing aircraft, said Chris Jaran, vice president for Bell Helicopter in China. “The flexibility PBN delivers to operators translates into less fuel burned and time in the air, effectively increasing the number of flights a helicopter can perform before requiring maintenance,” added Hughes Aerospace president and CEO Chris Baur.